Cycling's spring races are always the most anticipated of the year, not only because they herald the start of the season, but also because they are brutally difficult and spectacularly unpredictable. Known as the Spring Classics, these one-day races test cycling's toughest riders with the worst conditions imaginable sucking mud, choking dust, leg-numbing sleet, fanatic spectators, and Europe's narrowest, most bone-grinding country roads. Clattering through agrarian hamlets on routes established a century ago, the Spring Classics celebrate cycling's most glorious and meaningful history. Riders that perform well amidst the intensity of these one-day races are acclaimed as cycling's hard men. 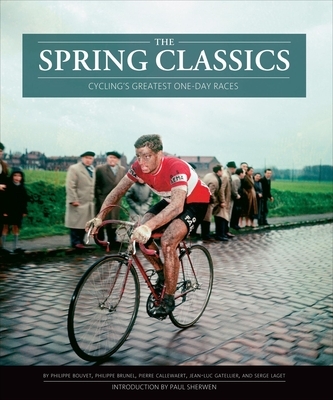 "The Spring Classics" delves into the stories of Milan-San Remo, Ghent-Wevelgem, the Tour of Flanders, Paris-Roubaix, the Amstel Gold Race, La Fleche Wallone, and Liege-Bastogne-Liege through hundreds of rare and restored photographs presented in a lavish format. With authoritative text from cycling's expert sportswriters, "The Spring Classics" commemorates the riders, traditions, and secrets of cycling's greatest one-day contests. The authors are top sportswriters for "L'Equipe," a leading European cycling and sports publication.